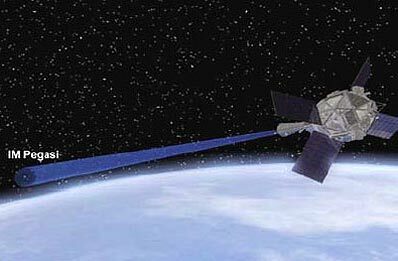 NASA's Gravity Probe-B is an exotic satellite mission to test aspects from Albert Einstein's general theory of relativity. 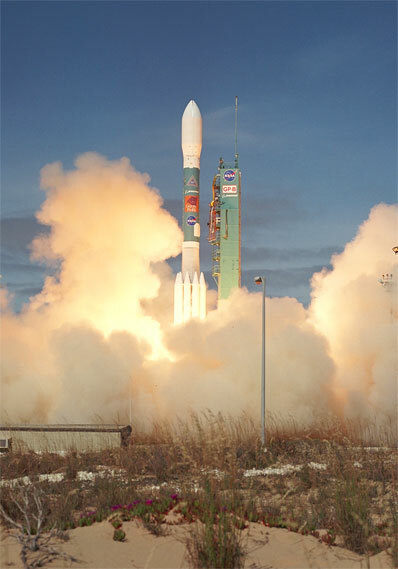 Boeing's workhorse Delta 2 rocket has flown more than 100 times, launching military, scientific and commercial satellites. A slender Boeing Delta 2 rocket boosted NASA's Gravity Probe B spacecraft into polar orbit today, kicking off a $700 million mission to precisely measure how gravity warps and twists the fabric of space and time. If successful, the mission will confirm - or contradict - two fundamental predictions of the general theory of relativity, Einstein's elegant explanation of gravity that has stood the test of time for more than three quarters of a century. Either way, scientists who have been waiting 40 years for the measurements in question say the results will provide profound new insights into the nature of gravity, the least understood of the four fundamental forces of nature. "We are extremely excited," Rex Geveden, the Gravity Probe B program manager at NASA's Marshall Space Flight Center, said Sunday. "The interest in this mission is extraordinarily high, not only because of the number of people that have worked on this program over the years, but I think because of the interest in Einstein and general relativity. So we're really excited." Orbiting directly above Earth's poles at an altitude of some 400 miles, the 7,000-pound GPB, about the size of a delivery van, will use a telescope and four ultra-cold, ultra-precise gyroscopes - the most accurate ever built - to measure tiny changes in orientation with respect to a guide star. It will take 12 to 14 months to collect the required data. Einstein's theory predicts Earth's gravity will distort, or warp, space in the planet's vicinity, much like a bowling ball resting on a taut sheet of rubber would form a depression. It's difficult to imagine this "geodetic effect" in three-dimensional space, but principal investigator Francis Everitt of Stanford University provided a relatively simple explanation. Draw a circle on a piece of paper. The circumference is 2 times pi times the radius of the circle. Now cut out a small wedge and glue the altered circle back together. The paper will no longer be flat, it will be warped into a shallow cone. If the circle is the size of Gravity Probe B's orbit, the effects of Earth's gravity will cause a similar distortion. But the effect is very subtle. Instead of 2 times pi times the radius, the circumference will be 2 times pi times r minus 1 inch. The geodetic effect has been observed before by measuring the way the gravity of the sun, for example, bends starlight or radio signals. 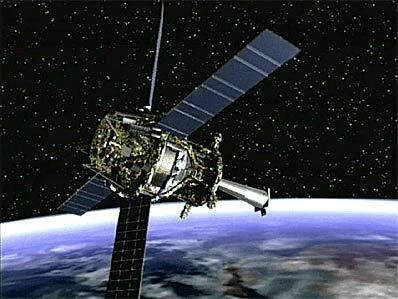 Gravity Probe B will improve those measurements by a factor of 10 and possibly more. The other objective of the Gravity Probe mission is to measure "frame dragging," a phenomenon predicted by Einstein in which spacetime around a rotating body is pulled and twisted much like honey wraps around the spoon stirring it. Frame dragging, which has never been measured, may be related to the origins of inertia, the property of matter that resists changes in motion. The measurements are extraordinarily difficult to make. The former requires detection of a tiny, in-plane drift while the latter requires measurements of a drift perpendicular to the plane of the spacecraft's orbit. Over a full year, the spin axis of each Gravity Probe B gyroscope should drift away from the guide star by 6.6 arcseconds due to the geodetic effect. Frame dragging will produce a drift of just 40.9 milliarcseconds. An arcsecond is about 1/4,000th of a degree. To put those numbers in perspective, a slope with an angle of 40.9 milliarcseconds would rise just one inch over a distance of 100 miles. Put another way, that's an angle nearly 500 million times smaller than the angle between the minute marks on a clock. "So what are the two specific things that GPB will do?" asked Michael Salamon, Gravity Probe B program scientist at NASA headquarters. "It's going to test two predictions of Einstein's general theory of relativity. One, it's going to measure the warping of spacetime due to the presence of a massive object. In this case, the massive object is the Earth. The second objective is to measure the twisting of spacetime by a rotating massive object, in this case the Earth. "Just as we take a teaspoon and put it in a jar of honey, if we twist the spoon we actually see the honey twist around the spoon. The farther we get away from the spoon, the less the honey is disturbed. As we get close to the spoon, the honey moves around with the spoon. Exactly the same thing happens in spacetime about a rotating Earth. We actually twist spacetime as the Earth rotates. This is an effect that has never been directly measured before and it's one of the extraordinary predictions of Einstein's theory of relativity." To make the measurements, Gravity Probe B is equipped with four electrically suspended gyroscopes imbedded in a liquid helium dewar. The gyros are made up of fused quartz spheres the size of ping pong balls that will spin at 10,000 rpm during normal operations. Considered the most perfect spheres ever manufactured, each gyro varies from perfection by just 40 atomic layers. If one of spheres was scaled up to the size of Earth, the tallest mountain and deepest ocean trench would measure just eight feet. To measure the anticipated drift in the spin axis of each gyro, GPB is equipped with magnetometers called super-conducting quantum interference devices, or SQUIDs, that can detect changes as small as 1/40,000,000th of a degree - 40 milliarcseconds. The gyros are shielded and isolated from any external forces that could interfere with or mask the anticipated relativistic effects. 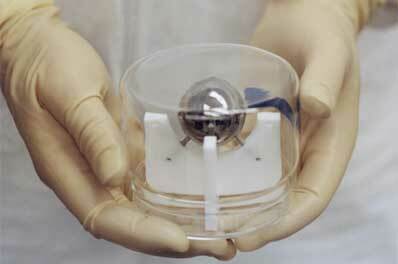 "At the heart of the experiment are four tiny, ping pong-sized gyroscopes," said Geveden. "These gyroscope rotors are used to make the Gravity Probe B measurements and they are immersed in a bath of superfluid liquid helium and are maintained at a temperature of 1.8 Kelvin throughout the duration of the mission. That's about 450 degrees Fahrenheit below zero. The spacecraft flies in a drag-free orbit and what that means is that the gyroscope rotor is literally in free fall about the Earth and the spacecraft flies around the gyro." At least nine new technologies had to be developed - and numerous political hurdles overcome - to make Gravity Probe B possible, an on-again, off-again effort that ended up taking four decades - and defining Everitt's professional career. "The NASA funding began at a research level in 1963 and I was working on the program in preparation for that so I have been on it for something like 40 years," Everitt said. "Of course, the reasons for this are we've had to invent all sorts of new technologies that simply didn't exist when Gravity Probe B began. We had to develop a new approach to containing helium in space, we had to fabricate new kinds of gyroscopes, we had to invent new pointing methods for spacecraft and so it's a whole stream of things that had to be invented before this test of Einstein became possible." Relativity theory is one of the two pillars of modern physics. But at very small scales, it does not mesh with quantum theory and physicists know Einstein's elegant description of gravity must fail at some point. While most scientists expect Gravity Probe B to confirm Einstein's predictions, any significant deviations could provide hints of that ultimate breakdown. "Gravity is extremely difficult to measure. Deviations are extremely difficult to measure," said Salamon. "However, we know that a future 'theory of everything' is going to show that Einstein's theory of relativity fails at some level. It has to. How is it going to fail? We don't know. But GPB ... has a chance of uncovering a failure of Einstein's relativity. This would be the most exciting accomplishment of GPB."